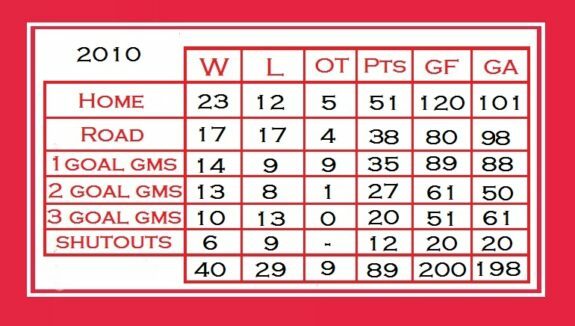 Following 2 seasons of centennial celebrations and some very drastic roster shuffling, 2010 may have been the most successful season of the decade for the Montreal Canadiens. 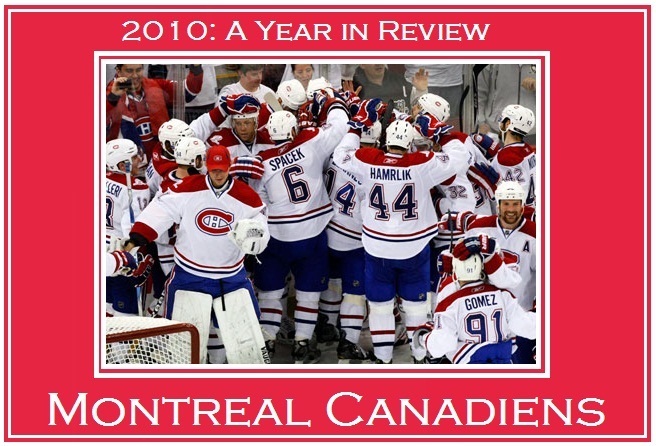 Rounding out the calendar year with a 3-2 overtime victory over the Florida Panthers on New Years Eve, thanks to newcomer James Wisniewski, the Habs completed a tremendous 2010 that saw them overcome and overachieve in the face of turmoil and adversity. * Please note that this is a team breakdown(month by month) and not individual player stats in 2010. – In terms of the numbers, Montreal didn’t exactly sparkle through January, yet signs of life were visible as 2 of their 4 wins came in the form of shutouts. 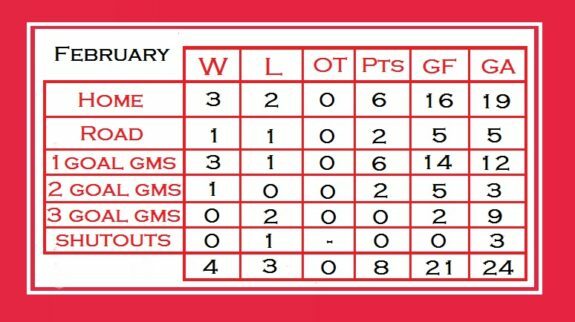 There were no discernable streaks(wins or losses) worthy of a mention as Montreal ping-ponged their way into February and the Olympics. – February was a short month for everyone as the NHL participated in the 2010 Vancouver Olympics, yet before the Habs broke for 2 weeks they began to show glimmers of the strong team game they would eventually become. – February also marked a month of change in management as Canadiens GM Bob Gainey stepped down in favor of Pierre Gauthier. Gauthier, who was Gainey’s right-hand man, took over amid much controversy yet with the encouragement of the new ownership(the Molsons) and Gainey, Gauthier quietly picked up where Bob left off. – By the numbers; the Canadiens won 3 consecutive games from February 2nd through the 6th. They were shutout once. – Tomas Plekanec, Jaroslav Halak, Andrei Markov and Andrei/Sergei Kostitsyn participated in the Olympic Games while the rest of the team took two much needed weeks off to prepare for the stretch drive. – The Habs sole upgrade at the trade deadline was Dominic Moore as Gauthier traded a 2nd round pick to the Panthers in order to procure the defensive centerman. – By the numbers; the Canadiens won 6 games in a row(from March 6th through 16th), vaulting themselves up the standings. This particular 6 game winning streak can basically be cited as the reason why Montreal managed to snare the final playoff spot. The team did not shutout any of their opponents in March while being shutout once. – As usual, the final month of regular season play(April), would prove to be a very important month for the Canadiens. Although a strong March was responsible for putting the team into contention, they weren’t guaranteed a spot until the final few games of the season. Therefore it could be argued that the 5 points the Habs picked up in April were the 5 most important points of the 2009-10 regular season. – Regardless of how they made the playoffs(ok, in this case it was again by the skin of their teeth), in hindsight it’s safe to say that not too many pundits saw what was about to happen next. – By the numbers; the Habs played .500 hockey in April, but aside from going 2-1-2 in their final 5, there really wasn’t much to note. – It would have been easy to say that the Canadiens were going to get 2 home playoff games and that that was going to be it for them in the spring of 2010, yet little did the Capitals know that taking a 3-1 series lead over the Canadiens would land them in their most precarious position of the season. With a commanding 3-1 lead, and no apparent problem in putting pucks past the Canadiens goaltenders, Washington’s offense suddenly came up against a brick wall as Jaroslav Halak wound up pulling off one of his 2 playoff miracles, holding the Caps to barely a goal a game over the final 3 as Montreal won Games 5, 6 and 7 en route to a date with the Pittsburgh Penguins. – By the numbers; Halak’s name became affixed to stop signs all across Quebec after his heroic performance to shut down the Capitals in the final 3 games of Round 1, yet that wasn’t before the Capitals managed to score a series total of 28 goals(most of those coming in the first 4 games). The Habs scored only 15 goals versus Washington, yet their timely scoring proved to be the difference in the series as Montreal pulled off the most stunning upset of the first round. – The cat may have gotten out of the bag as Montreal’s upset over the Capitals turned many heads, but it was safe to say that expectations were still tempered as the Canadiens turned their attention to the reigning Stanley Cup champion Penguins. – It was a tremendous series as the Penguins and Canadiens traded wins back and forth and Michael Cammalleri and Jaroslav Halak challenged Crosby and Fleury game in and game out. Much like in round 1, the end result proved to Halak out-dueling Marc-Andre Fleury, despite Fleury managing to shut the Canadiens out in Game 3. – The surprise factor of Montreal’s stunning back to back series upsets over the Capitals and Penguins was only masked by the fact that the Philadelphia Flyers managed to come back from a 3-0 series deficit to beat the Boston Bruins, ultimately pitting the two Cinderella stories against one another in the Conference Finals. – Unfortunately for the Montreal Canadiens and Jaroslav Halak, their streak of upsets came to an end as they came up against the physically superior Flyers and their extremely deep offensive core. Montreal put up a fight in only one game(Game 3 – when they won by a score of 5-1), but aside from that one emotional victory on home ice, the Flyers absolutely dominated the Canadiens, shutting them out 3 times en route to their date against the Chicago Blackhawks in the Stanley Cup Finals. – The Habs impressive and stunning playoff run led to a few revelations about the leadership core, goaltending and coaching – all of which seemed to be quite a bit stronger than first imagined. – The impressive playoff run forced management into a few difficult decisions as they would wind up parting with Jaroslav Halak, among other key players. – The Canadiens flushed out their lineup through the pre-season, re-signing Carey Price and adding centerman Jeff Halpern in September before going 4-3 in 7 exhibition games, naming Brian Gionta captain in the process. – With playoff savior Jaroslav Halak now plying his trade in the Western Conference with the St. Louis Blues, the Montreal Canadiens once again entered the NHL regular season with tempered expectations. Alot of that had to do with the concern surrounding Carey Price and how he would bounce back from a rough 2009-10, yet as the Habs began the 2010-11 campaign it was clear to see that they were picking up right where they left off in May. – By the numbers; the Habs won 4 in a row(from October 23rd through 29th) as they tore through their competition in October, earning 15 of a possible 22 points. The Canadiens would be shutout(a trend they seemingly cannot escape), yet countered with Carey Price’s first shutout of the season. – Following up on their remarkable start to the 2010-11 regular season in October, the Canadiens kept pace as they continued winning on the strength of their defensive play and the fact that Carey Price was playing up to his potential and perhaps even beyond his expectations. – By the numbers; The Habs won 9 games in November, collecting 18 of a possible 26 points and top place in the Northeast division. They won 4 in a row(from November 9th through the 16th). 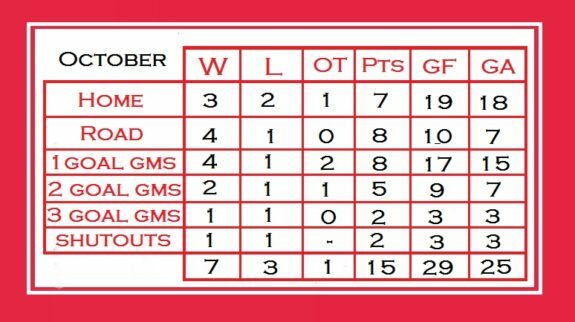 Of note, the Habs enjoyed 3 shutout wins in November(all Carey Price) yet were shutout by opponents just as many times(3). Of the 4 losses sustained in November, 3 were shutouts – a troubling sign as the Canadiens lack of offense would come back to haunt them in December. Montreal outscored opponents 31 to 22, their strongest month in 2010. – The Canadiens continued their strong play to start off the month, winning 3 straight(from December 2nd through the 7th), placing themselves atop the Eastern Conference, but that wouldn’t last long as Montreal departed on their longest road trip of the season(Dec.19-31st). The Canadiens strong play couldn’t go on forever and as they played through their 7 game road trip, the Habs finally began to show signs of wear and tear, eventually losing 5 of the first 6 games of the trip before salvaging it slightly with an overtime win against the Panthers on New Years Eve. – By the numbers; the Habs actually won 3 in a row(from Dec.2nd through 7th) yet also managed to lose 3 in a row(from Dec.26 through 30th). They were outscored 43 to 34 and shutout once(by the Capitals) while posting a 5-8-1 record, the 11 points tying January 2010 as their least productive month of the year. It’s definitely been a year of ups and downs for the Montreal Canadiens, but after reviewing their overall performance, it’s clear to see that the Habs exceeded expectations, especially when it mattered most.